Featured apartment of March – Garden View apartment! Along with sunny days in March comes the true refreshment for every taste – the exclusive Garden View apartment! With its perfect location, modern design and a large space with 3 bathrooms – this apartment is highly recommended for families or a group of friends who are coming to Barcelona to have the perfect and relaxing vacation. Are you looking for a comfortable and affordable holiday apartment? Traveling on a budget is not an unusual term with travelers anymore. Tourists tend to shift money from accommodation to experiences and activities at the destination city. The question is, how to find affordable, yet comfortable and modern accommodation for your stay in Barcelona? Featured apartment of February – Barceloneta! 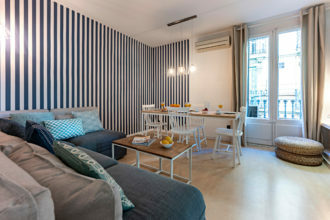 Under the spotlight for the month of February – refurbished Barceloneta apartment! Perfect location, modern design, traditional building – Barceloneta is the ideal option for a relaxing family’s stay in Barcelona.